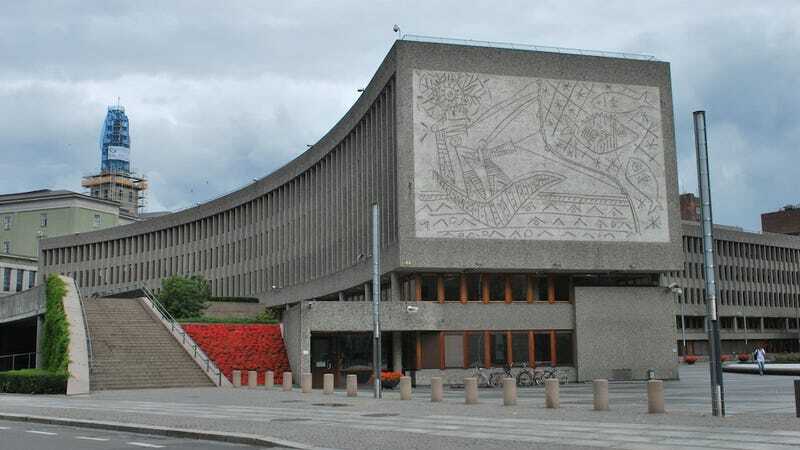 Norway finds itself in a tough conundrum after a terrorist attack crippled a pair of Brutalist buildings in downtown Oslo. Tearing down the buildings is one thing—they're crumbling, controversial and, well, brutal. Destroying the Picasso murals carved into the concrete, however, is an entirely different matter. Altogether, four Picasso-designed murals grace the walls of the Regjeringskvartalet, or "Government Quarter," buildings. The childlike scenes, which were executed by Norwegian artist Carl Nesjar, represent Picasso's first foray into concrete murals. They range in size from The Fisherman, a 42-foot-long scene that takes up an entire wall of the low-slung Y-block building (above), to The Beach, which is carved into an interior wall of the H-block building (below). Needless to say, these works of art are difficult to move. And since Picasso designed them for a specific purpose, art experts believe that they'll be corrupted by a new location. "[They] are not like paintings that you can easily take down and move around," Claudia Andrieu of the Picasso Administration recently told The Wall Street Journal. "[Picasso] made those works for these particular buildings and not any other." She added, "It is unbelievable that the report recommended tearing down these buildings without contacting us." Whoops. There's also the architecture angle. The H-block and Y-block buildings represent prime examples of the classic, once-fashionable Brutalist style. Designed by Norwegian architect Erling Viksjo, they borrow directly from Le Corbusier's similar buildings in Marseilles and the United Nations headquarters in New York City. However, the Oslo buildings were badly damaged by a car bomb in Anders Breivick's 2011 attack on the capital. To repair the buildings would cost upwards of $70 million, and some of Oslo's leaders think that money would be better spent building modern office buildings.